Field-programmable gate arrays provide an economical alternative to application-specific integrated circuits for motion control applications. There was a time an OEM machine builder or device manufacturer with unusual requirements would think nothing of substituting an application-specific integrated circuit (ASIC) for their off-the-shelf motion controller. Today, with the cost of mask sets starting around $5 million, the value proposition has changed. Manufacturers selling hundreds of thousands of units can still justify the cost of an ASIC amortized over the lifetime of a product line. Increasingly, though, low-volume OEMsv are turning to field-programmable gate arrays (FPGAs) and applications as an economical alternative. Marc Perron, President of Alizem Inc. (Quebec City, Canada), which specializes in motor-control IP for FPGA-based motor drives, likens the shift toward FPGAs to the evolution from cell phones to smart phones. In cell phones, the chips are dedicated to one application and cannot be upgraded over time. With the iPhone, users can tailor the operation of their device using a broad selection of applications from a variety of third-party sources. “Apple has decoupled the platform and the functionality," he observes. 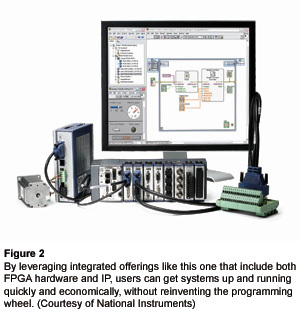 "I can apply my third-party applications to customize my iPhone, and this is exactly the same thing that's happening in industry with FPGAs and IP.” The new approach allows motor drive system designers to reduce cost and time-to-market by implementing their system on a common hardware platform while still differentiating it via an application-specific configuration of software/IP components. 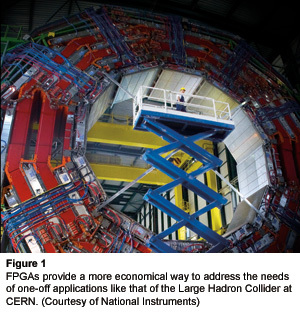 Flexibility is one of the key benefits of FPGAs. As direct, programmable devices, they bring substantial data processing capabilities to the table. Designers can program them to perform parallel as well as serial processing, making them ideal for applications that require extremely fast data processing, such as real-time motor control. Even better, FPGAs can be reprogrammed simply and easily, for example as control algorithms change. Of course, we live in the real world so FPGAs present not just benefits but trade-offs. To best leverage the technology, not to mention meet their development timeline, organizations need a different engineering skill set. Rather than staffing their department with technicians and controls engineers, for example, they need software and electrical engineers. That said, programming FPGAs is far simpler than it once was, courtesy of extensive toolkits and an increasing library of applications from a range of vendors. “Third-party IP is an effective way to access specialized expertise that’s rare to find and to allow system designers to focus on their specific product differentiation,” Perron notes. Software engineers, in contrast, want to execute as much of the application as possible in code. They’d rather focus on programming system functionality and creating applications that will make the best uses of the hardware resources available. FPGA and third-party software vendors offer tools to automate the hardware design functions, allowing software engineers to focus on driver and application development. Like any closed system, FPGAs require thermal management. Their unique architecture allows them to offer some original solutions to the issue, however. Rather than running a single 200 MHz data path through the hardware serially, for example, designers can easily split it into five parallel paths, each operating at 15 MHz. That approach drops both power demands and the amount of heat generated. As FPGA awareness has gone up, cost has dropped, driven by increasing volumes. One challenge is that FPGAs used for motion typically don’t need 32-nm-node processors. To remain competitive, foundries have to modernize their infrastructure to the latest processes, especially because other applications for FPGAs do need devices with smaller critical dimensions. That conflict does apply some upward pressure to prices, but overall, FPGAs are well-positioned to remain cost competitive. Despite all that, application still exist for which the best solution is an ASIC, whether because of very high volumes, or specialized performance. It really comes down to the overall system cost, schedule, and performance, and what is the best fit for the task at hand. There is a break point at which customers need a certain level of performance that they cannot get from an integrated product. Overall, FPGAs remain a solution worth investigating for OEMs, allowing designers to integrate hardware functions such as 32-bit microprocessor, PCIe, memory blocks, and external memory controllers in a single piece device. “It’s much more cost effective and efficient than implementing each function as a discrete component on a PCB,” Mallet says “Doing it in an FPGA is much more cost effective than doing it in an ASIC for a growing number of applications, especially the many systems in a factory.” Particularly with the increasing availability of software tools and readily available IP, FPGAs are becoming a more appealing alternative all the time. “An FPGA is like a blank canvas-you can do anything you want with it,” he adds. What most OEMs want is to provide a solution that best benefits their customers, and FPGAs provide an excellent means to do just that.